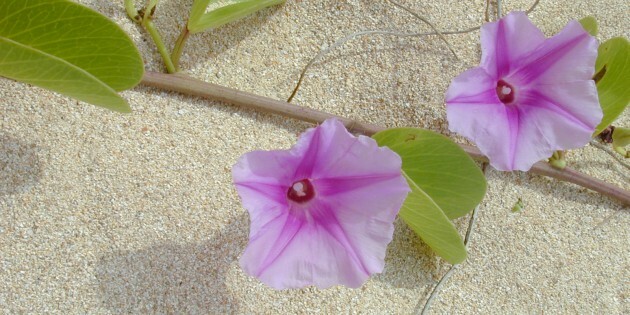 Coastal areas of Hawaiian Islands can be thought of as a single natural system but one with multiple “neighborhoods.” The plant and animal community structure is influenced by proximity to the ocean—the more salt-tolerant plant species, for example, inhabit the coastal strand, where they are subject to frequent salt spray. Substrates range from coral to basalt cliffs, from sandy beaches to volcanic ash to boulders. There are dunes, wetlands, ponds, tidepools, and back beaches. Windward areas can receive up to 308 centimeters (120 inches) of rain per year; leeward shores may receive less than 128 centimeters (50 inches). Some areas such as the coastline near Makena receive less than 38 centimeters (15 inches) of rain each year. In this unit, students learn about some of the most common coastal plant and animal species, how the species composition of the coastal zone has changed over time, and the patterns of dispersal and migration that affect species composition in this ecosystem. Students make visual representations of how species composition of coastal areas has changed since human settlement. Students hone and demonstrate their knowledge of Hawaiian coastal species by playing a game. 1. What are some of the main native and non-native plant and animal species represented in the coastal ecosystem on Haleakalā? 2. How have coastal areas in Hawaiʻi changed since humans settled the islands? 3. How have coastal plant and animal species reached the islands, and from where? Native and introduced plant and animal species. Habitat zonation. Origin and distribution of species. Coastal areas were important in ancient Hawaiian society, and they continue to be popular areas for habitation, recreation, and food. They also offer distinct habitats for a wide range of plants and animals. Many Hawaiian coastal species are also found throughout the world, adapted to live near the ocean and disperse through ocean currents. • Determine the accuracy of student schematics of today’s coastal areas (Activity #1 “Coastal Inhabitants”). Make field observations on a blank “Coastal Schematic” copied onto a sheet of paper. • Investigate what the coastal ecosystem may have been like prior to human settlement. Research topics such as fossil evidence of extinct bird species and how Polynesian and European settlers may have changed vegetation patterns and caused bird extinctions. • Do the Activity #1 “Coastal Inhabitants” exercise of mapping the origins of coastal species with native species only. Then create another map that represents introduced species only. Compare the two. • Play additional rounds of Coastal Jeopardy (Activity #3) using more complicated “Final Jeopardy” questions that require critical thinking and a mastery of the unit subject matter. Have teams challenge each other with questions of their creation based on what they have learned about Maui coastal species. Eyre, David L., By Wind, By Wave: An Introduction to Hawaiʻi’s Natural History, The Bess Press, Honolulu, 2000. Hawaiʻi Audubon Society, Hawaiʻi’s Birds, Hawaii Audubon Society, Honolulu, 1997. Howarth, Frank G. and William P. Mull, Hawaiian Insects and Their Kin, University of Hawaiʻi Press, Honolulu, 1992. Medeiros, Arthur C. and Lloyd L. Loope, Rare Animals and Plants of Haleakalā National Park, Hawaiʻi Natural History Association, Hawaiʻi National Park, 1994. Olson, Storrs L., and Helen F. James, “The Role of Polynesians in the Extinction of the Avifauna of the Hawaiian Islands,” in Martin, P. S., and Klein, R. G. (eds), Quaternary Extinctions, University of Arizona Press, Tucson, Arizona, 1984, pp. 768-780. Polhemus, Dan and Adam Asquith, Hawaiian Damselflies: A Field Identification Guide, Bishop Museum Press, 1998. Pratt, H. Douglas, A Pocket Guide to Hawaiʻi’s Trees and Shrubs, Mutual Publishing Company, Honolulu, 1998. Pratt, H. Douglas, A Pocket Guide to Hawaiʻi’s Birds, Mutual Publishing Company, Honolulu, 1996. Stone, Charles P. and Linda W. Pratt, Hawaiʻi’s Plants and Animals: Biological Sketches of Hawaii Volcanoes National Park, Hawaiʻi Natural History Association, Hawaiʻi National Park, 1994.